Sabine Hyland » Blog Archive » Cook? Victim? Poisoner? 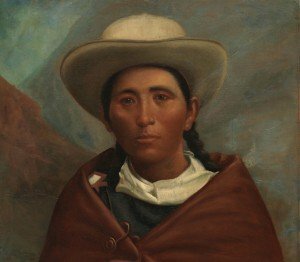 Is this young Andean woman a victim of Father Albadán’s abuse? Is she his cook, Francisca, whom he forced to work for him through fear? And if so, did she slip some fatal herbs into his soup one day? I chose this haunting image for the cover of The Chankas and the Priest to represent both Albadán’s victims and the woman who may have brought about his untimely demise. It was important to me that there be a native Andean person on the cover, rather than an image of the brutal priest who tormented the Chankas for a decade (1601-1611). It took my 10 years to write the Chanka portion of this book, and 2 years to write the Albadan portion — ultimately this work is my tribute to the Chanka people of Apurimac, Peru, who opened their homes and their archives to me.